What If Chemo Doesn't Help You Live Longer Or Better? 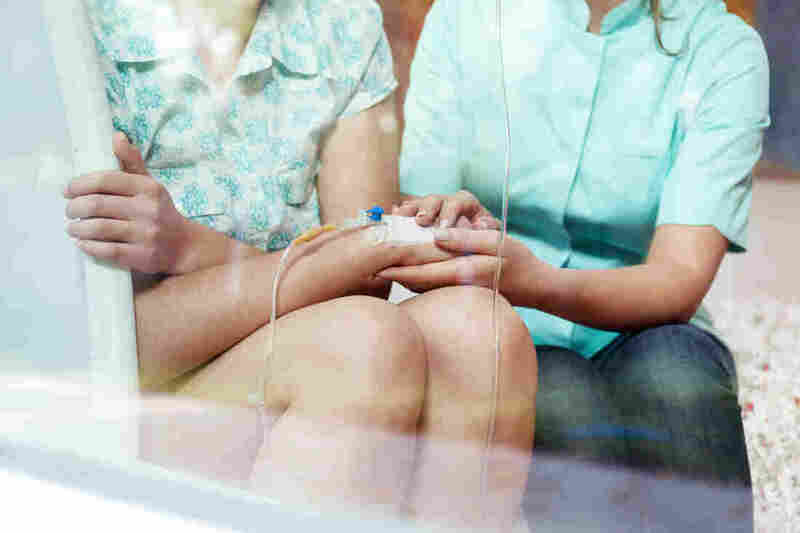 Terminal cancer patients sometimes get chemotherapy in the belief that it will ease their symptoms. But a study finds that many who get the treatment near death actually have a poorer quality of life. For best quality of life, many cancer patients who can't be cured might do best to forgo chemo and focus instead on pain relief and easing sleep and mood problems, a survey of caregivers suggests. We're not talking here about standard chemotherapy, which can be used to greatly prolong life and sometimes cure cancer. Instead, the study published online Thursday, in the medical journal JAMA Oncology, focuses on chemotherapy given to people with solid tumors who have been diagnosed with terminal disease and aren't expected to live more than six months. "Chemotherapy is not meant to cure people like that," says Holly Prigerson, director of the Cornell Center for Research on End-of-Life Care. Even so, people with advanced cancer are sometimes given chemotherapy with the hope that it might slightly prolong their lives or make them more comfortable. Prigerson and her colleagues decided to see whether chemotherapy in this circumstance actually does improve a patient's quality of life. So they talked to the patients' caregivers and asked them how the patient fared during the final week of life. "They assessed things like their mood, how anxious they were, their physical symptoms and their overall quality of life," Prigerson says. Her study found that chemotherapy often harmed these patients at the end, reducing their quality of life. And it didn't extend their lives, either. This was even the case for patients who had been able to keep active and felt relatively OK when this new round of chemotherapy began. "The conventional wisdom," Prigerson says, "is that patients and oncologists think, 'Why not? I have nothing to lose.' And I think the wake-up call from these data, really, is to say, 'There are harms being done, and there is a cost to getting chemo so late.' "
She acknowledges that some people may still opt for chemotherapy in these circumstances. But she thinks patients and doctors need to better understand the pluses and minuses of treatment at the end of life. "I think some patients would say, 'I don't care, I want to be on chemotherapy; it gives me something to do and it makes me feel that I'm fighting my cancer,' " she says. "That's fine, if patients know that the likelihood of them benefiting from that chemotherapy is still remote, and it will probably make them feel sicker because of toxicities and side effects of the treatment." But doctors should not encourage that approach to cancer care, says Dr. Charles Blanke, an oncologist at Oregon Health and Science University's Knight Cancer Institute. "I think this paper strongly argues that giving chemotherapy near the end of life — that is, in patients with terminal cancer — should not be the default, and oncologists should have a darn good reason if they want to do so," Blanke says. In an editorial accompanying the research paper, Blanke and Dr. Erik Fromme, an internist and palliative care specialist at OHSU, argue that it's time to change this accepted medical practice. They write that "equating treatment with hope is inappropriate." "If the doctor really doesn't expect you to be around in six months, it's probably better to focus your time on something that's not chemotherapy," Blanke tells NPR. He focuses instead on pain relief, mood issues, sleep disturbances and other problems that can affect a patient's quality of life. Dr. Lowell Schnipper, who heads oncology at Beth Israel Deaconess Medical Center, helped draft treatment guidelines at the American Society of Clinical Oncology. He says he's not ready to abandon them just yet. "I think this is a wake-up call to talk to our patients," Schnipper says. Patients do need to hear a doctor say that a situation is truly dire when it is, he agrees. But each patient is different, he says, and novel approaches may sometimes be worth trying even in patients like this. Still, Schnipper says doctors haven't spent enough time considering quality-of-life issues in these circumstances. "That is actually an important gap in our research knowledge, and this paper might actually be a step toward filling that gap," Schnipper says. New Medicare rules also pay doctors to take the time to discuss end-of-life issues, and oncologists say that step could help get more of these conversations started as well.